Well spit spot and a stiff upper lip, the plucky Brits are rolling up their sleeves and getting stuck in. 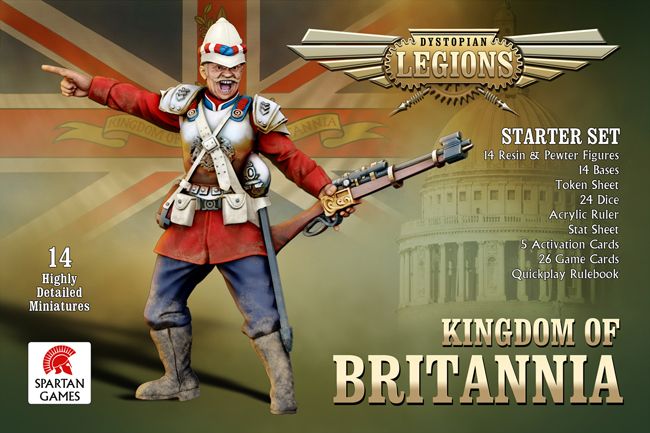 No, I haven’t had a stroke, I’ve just finally got my hands on the Britannian starter set for Dystopian Legions by Spartan Games and it’s all very exciting. So, what do you get in the box? Well aside from a very generously proportioned quick start rule book, some card, dice and counters you also get 14 blokes including some line infantry, a chap that looks suspiciously like Lord Flasheart from Blackadder and the completely and utterly fantastic Sky Hussars. First of all I have to address the elephant in the room. These models aren’t 25mm. Not even close. I have no idea why it was billed as a 25mm game when the models are 30mm. A line infantrymen stands as tall as a Space Marine. In fairness, I have no problem with this at all. I like the bigger scale. 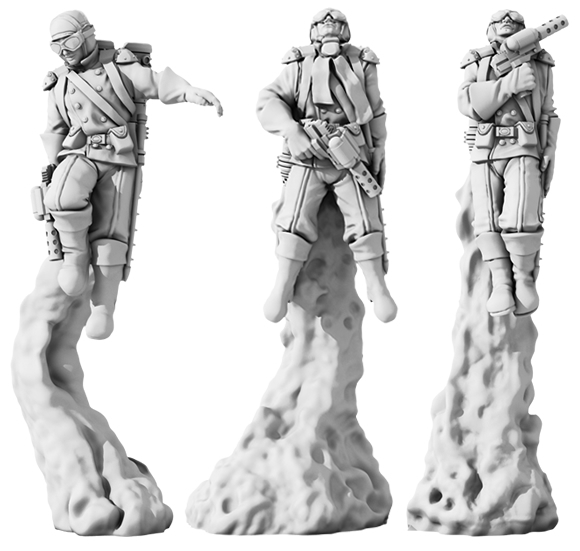 The models are more substantial and that extra 5mm can mean a lot of extra detail. However, it just seems daft to have called it a 25mm game when very early on it would have been apparent it wasn’t. Something that came as a surprise was the fact that the models are metal. Considering Spartan is a company that cut its teeth and made its hay with resin, and with the spiralling cost of metal, it doesn’t seem all that logical to me. Especially as the casting quality on a couple of the line infantry wasn’t to the usual standard I know Spartan reach. It wasn’t catastrophic and it’s all fixable with a file and bit of time but it’s just a bit of a disappointment. The models themselves, however, are superb with bags of character and once painted will look gorgeous on the board. I must admit my Brits will be the green jackets. The line infantry are actually a really nice blend of history and the steam punk science fiction. The armour is obvious but not overly sexed up to make it too obvious. The rifles, again, are subtly sci-fi which emphasises the industrial crudity with which the Britannians approach the business of war. All the while being terribly nice chaps and keeping ones uniform clean and neatly pressed. 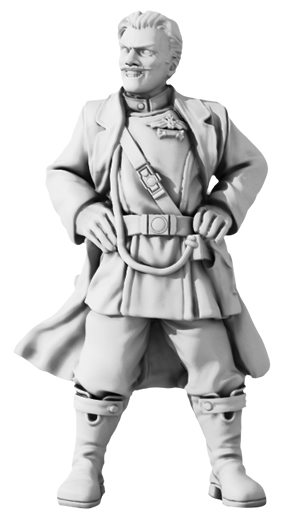 Lord Flasheart aka Captain Gilbert ‘Bertie’ Smethington II leads the force and is every bit the blustery grinning noblemen that has become so iconic of the Imperial Britain. It’s a cool model and is terribly British. However, my one gripe and this applies to other character models I’ve seen is that they border on the comical. They’re just that little bit too exaggerated. Too comic book. Too cheesy. And they stick out against the rest of the faction but not in a good way. They, for me, don’t fit in the superbly crafted steampunk world we’ve come to enjoy with Dystopain Wars. Don’t even get me started on Scattergun Sam for the FSA. However much of the damage is made up by the completely brilliant Sky Hussars. I got to see these models back in September and they are just inspired. This is Spartan getting the steampunk influences exactly right. The plumes of smoke are such a cool touch and although between those and the Hussars being single cast bodies the room for variation is limited they still look fantastic. Because the plumes are resin and the rest of the model is lovely heavy metal I think it’s reasonable to assume that they’ll fall over. A lot. So save yourself some heart ache and weight the base. In total honesty, I’ve seen a lot of models over the last 23 years and these have to be some of my favourites. It’s a perfect synergy between the militaristic simplicity of the Hussars combined with the ‘ray gun’ like weapons and the billowing clouds of smoke shooting from the rocket packs telling a story of just how experimental the technology is. They are superb. But what of the rules? Well, in a nutshell, they’re essentially the same as Firestorm Invasion, as I expected. This isn’t a bad thing as I really liked the mechanic. Like all other Spartan games the game works with alternate activations allowing for a more organic gaming experience than other more traditional turn based wargames. I like both systems but mechanic Spartan use for Dystopian Legions works best with alternating activations. However, like F:I, it uses a deck of cards to determine the order in which you activate your units. This can obviously go horribly wrong but it’s actually an ace rule that forces you to play your opponents hand which adds a real element of risk to the proceedings. It’s ever so slightly like playing poker. With models. Which I think is what’s been missing from poker this entire time. Statline are similar to that of F:I and Dystopian Wars in so much as models have a fixed set of statistics that represent their battle prowess as well as the number of dice they roll in a fight. And like Firestorm Invasion it uses the coloured exploding dice mechanic. Allow me to explain. If you’re rolling black dice a roll of a 6 is a single hit. If you’re rolling blue dice a roll of a 6 counts as two hits. If you’re rolling red dice a roll of a 6 counts as 2 hits and you get to roll again. An evolved mechanic from the one we know and love and one I can see being rolled out as the full second editions of their other core games come out. It’s straight forward enough and can be augmented up or down depending on certain factors such as range. Models have Injury Rating which is akin to DR if Dystopian Wars, and a Kill Rating which is essentially a critical hit that causes instant death. If I’m honest it seems slightly unnecessary as few models have a KR and it’s tough to justify for the ones who do considering they usually have greater Life Points which are essentially wounds. An armour save seems to be an easier way round it but I suspect that it was as much to keep it similar to the other Spartan systems as anything else. There’s also force building in Dystopian Legions which not only makes sense but is done in such a way to ensure that you take balanced forces that vaguely represent the forces of the 1800’s. Which I like a lot. It’s also needed as the percentage limits in Dystopian Wars is far too open to abuse and had Spartan done the same with Legions it would have just been everyone buying tanks and big armoured dudes. The rules are a big improvement on Dystopian Wars, being written in phases rather than leaping about the place. Diagrams match up with their explanations too. There are still a few rules that I don’t get, like formations. As far as I can tell having your unit in one formation or another has no bearing on the game what-so-ever other than being in Line formation makes you a sitting duck for anything that goes boom. So why would you bother? There’s the usual heavy-handedness with the bold button which makes paragraphs harder to read, and some sections are over explained but over all its easy enough to read. The book itself is very nicely put together with lots of lovely photography and is comparable in approach to the quick play book you get with the 4ok boxset. The thing that’ll make punter buy the main Dystopian Legions rule book is if it includes not only bags and bags of fluff, which is the one thing I think Spartan really need to get nailed down, and full faction lists. For both a model and gaming perspective I think Dystopian Legions is superb. The mechanic is solid and easy to pick up. The models are completely brilliant, slight casting defects aside, and each range boasts some real gems. As more models become available I can see Dystopian Legions from being a big hit. Just read through the rules last night. In open formation, models within the same unit block/impede line of sight to targets, whereas in Line Formation models in base to base ignore each other for LOS purposes, but are more likely to be hit by certain weapons.